The armature plates are quality ferromagnetic plates with fixing holes that are sized to suit both the energise to hold electromagnet and the energise to release electromagnet. They can be used as keeper plates in use to get the best clamping performance from the electromagnets and electro-permanent magnets and are often used when either no ferromagnetic material exists for the electromagnets to clamp onto or where the existing ferromagnetic surface is not ideal for best clamping (e.g. thin sheet, rusty steel, curved surfaces). Our armature plates allow our electromagnets to perform at their best - optimum holding forces, high magnetic permeability, low remanence. These Armature Plates are designed to fit our Energise to Hold Electro-Holding Magnets and Energise to Release Electro-Permanent magnets. 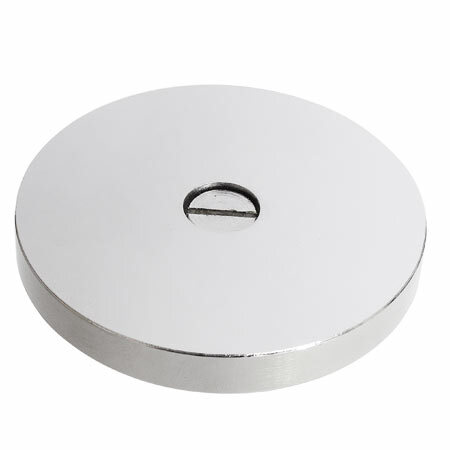 The Armature Plate is a high quality ferromagnetic plate to allow magnets, electromagnets, electro-permanent magnets and solenoids to clamp onto it. The armature plate has been designed specially to fit both our ranges of energise to hold electromagnets and energise to release electro-permanent magnets. The armature plate may also be known as a keeper plate. An electromagnet or electro-permanent magnet always needs a ferromagnetic surface to clamp onto – the ferromagnetic surface required is generally a mild steel or ferromagnetic stainless steel.The quality of the ferromagnetic material can affect the performance of the electromagnet or electro-permanent magnet. Thinner materials tend to struggle to carry the magnetism, magnetically saturating and failing to achieve the maximum possible holding forces of the magnets. Corroded materials and materials with poor magnetic permeability also result in reduced performance form the magnets. Surfaces that are not smooth (curved, rippled, indented) and surfaces that have coatings to create effective air gaps also cause reductions in the pull forces possible. As such being able to use a dedicated armature plate will allow our electromagnets and electro-permanent magnets to achieve optimal pull forces. The armature plates allow our energise to hold electromagnets and energise to release electro-permanent magnets to perform at their maximum possible holding forces by combining high magnetic permeability,low remanence, minimised air gap and optimum magnetic pathways. The armature plates come in diameters varying from 25mm to 100mm to match the diameters of the electromagnets and electro-permanent magnets we supply. Larger diameter electromagnets produce more magnetism requiring thicker armature plates to get the best performance,which is why our electromagnets are thicker as their diameter increases. The thickness (height) varies from 3mm for the D25mm version up to 12mm for the D10mm version. Our armature plates could also be used with other magnets and magnetic products where a ferrous surface for magnetic clamping is not available (but note that our armature plates are designed for best use with our energise to hold electromagnets and energise to release electropermanent magnets.